There are about a billion different types of hamburgers. 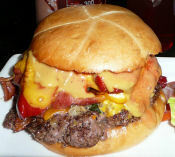 Just go to a couple of restaurants and you will see an array of deliciously tempting burgers. But, hey, build your own at home and save a couple of bucks! garnish of your choice - tomatoes, pickles, lettuce, etc. Go ahead and get your fire up and going so the grates will be hot. Combine the beef sauce onion, salt and pepper and mix thoroughly. Form 6 patties 3/4 inch thick. Separate them with hamburger patty paper if you have it. Place your burgers on the cooking grate directly over the fire/coals and cook to your preferred doneness. In the last minute or two, place the bacon on the burgers and cover with cheese and let it melt. Put your burgers together, and get down to some serious eating!